Many people say education is the only heirloom parents can give to their child that cannot be stolen. Graduation marks the achievement of a student's learning. It represents how ready a student is to face the working and professional world. However, this does affect not only the student but also the parents who worked so hard to see their child finally get the diploma. But what if they did not have the chance to see it? One student recently graduated and posted a photo on social media, which truly melted the hearts of everyone. 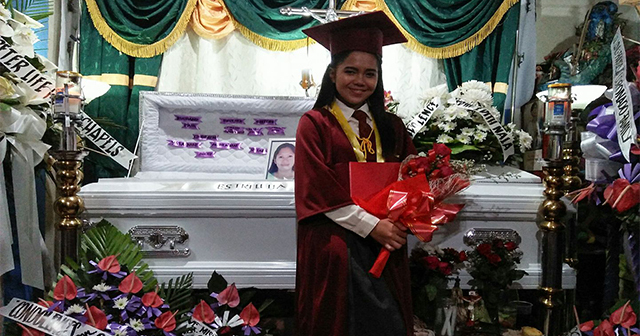 While most students would post selfie graduation photos or group pictures, Yssa Llaban Guy-ab posted a photo of her, holding a bouquet of flowers smiling broadly in front of her mother's casket. She seems to be smiling happily because she knew that her mother would be so proud of her for fulfilling her dreams and her mother's dream. The photo went viral moments after she posted it because the photo looked so heart-wrenchingly beautiful. It's the kind of picture that would touch your heart yet break it at the same time. The post garnered a lot of comments from her family to other netizens who surely are strangers to Yssa but gives her congratulatory and encouraging words while others admire her strength. A netizen even commented, "its bitter-sweet. Congratulations and condolence." Together with her photo, she simply captioned it as, "graduate nako Ma!" which is dedicated to her dear mother. Condolences to you dear Yssa. Life is full of obstacles but never give up on happiness. Congratulations on making it this far, remember your strength and thank you for being an inspiration.